It allows anyone to connect to your infrastructure, no matter what the intent or identity. The impact on your business is huge. Attackers increasingly use TLS as a vector to spread malware and hide command-and-control messages. The inadequacy of TLS forced enterprises to add CDNs/VANs to their internet architecture, and these authorized Man-in-the-Middle elements break the end-to-end data integrity and privacy TLS was meant to provide. The integrity of TLS depends on 3rd party solutions like Certificate Authorities and DNS providers doing their job well, something that is proving to be increasingly unreliable. TLS WAS NEVER ABOUT UNIFIED SECURITY. It puts compatibility over security, a requirement that attackers have successfully exploited. TLS IS NO LONGER THE ANSWER! In this day and age, conducting digital business with customers, employees and partners require a channel that does much more. REL-ID only accepts connection requests from devices that are Trusted and Trustworthy. During the initial registration process, REL-ID generates a unique device fingerprint for the customer's device and adds it to its database of Trusted devices. In addition, anytime a connection is being requested, REL-ID also validates that the device not only matches that fingerprint, but is also currently Trustworthy -- that it hasn't been rooted or jailbroken, and that it isn't running malware. If both those criteria are not met, which is virtually impossible for an attacker to simulate, then any connection request from that device will be instantly dropped. REL-ID strengthens the level of trust in your customer's connection with you by performing an authentication transaction is both Mutual and Simultaneous. Mutual refers to the fact that it is not only you validating your service's identity to the customer (which is the most common way by far in which TLS is deployed) but also that the customer is cryptographically verifying their identity to you. This is further enhanced by the fact that this authentication is simultaneous -- there is no opportunity for a Man-in-the-Middle type of attack where a malicious third-party can disintermediate the transaction and thus compromise or hijack the connection. REL-ID doesn't rely on the authentication only at the onset of a session. The underlying RMAK protocol strengthens traditional channel security by periodically re-executing the authentication transaction in order to continuously verify that both parties are mutually authenticated avoiding both client and server compromise scenarios such as a DNS compromise that kicks in while a user is already in a session with one of your applications or services. Ultimately, REL-ID gives you true end-to-end integrity and privacy. You have absolute, bulletproof, and non-repudiable cryptography that ensures that each and every interaction between you and your client is authentic, has not been tampered with, and is completely private. This trusted connection persists even when using valid third-party disintermediaries such as Content Deliver Networks (CDNs) and Value-Added Networks (VANs). And REL-ID does this all while delivering a phenomenal client experience across every channel you use. Learn how the REL-ID security platform takes fraud to zero and increases customer engagement by up to 300%. Subscribe to the Uniken Blog to stay up-to-date on the latest mobile app security industry news and trends. Banks struggle to ensure customers’ data and dollars are safe while at the same time ensuring great customer experience design across all channels. How do you balance these competing interests? 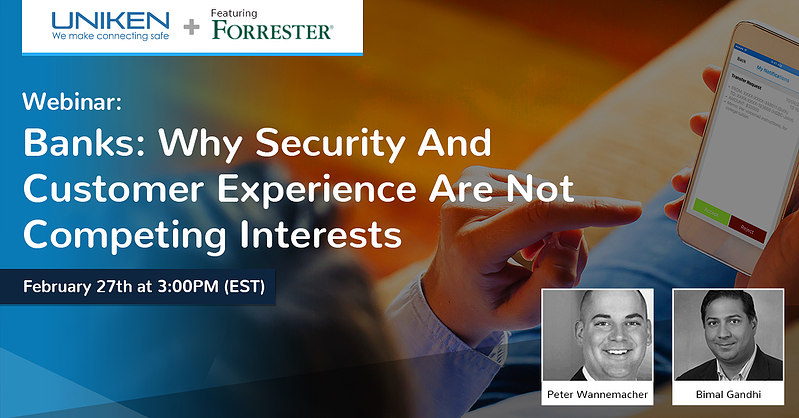 Join guest speaker Peter Wannemacher, principal analyst at Forrester and Uniken CEO Bimal Gandhi for our upcoming webinar on February 27 at 3pm.